Overweight Truck Violations | Chicago Overweight Truck Violation Lawyer The Davis Law Group, P.C. Overweight truck violations are frequently issued by police officers on roadways across the State of Illinois. 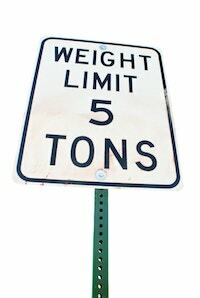 Trucking companies and truck drivers often face costly penalties for driving overweight on gross or overweight on axle. Ranging from a couple hundred dollars to several thousand dollars, these violations can jeopardize a truck driver’s employment and livelihood. Finding reliable and professional attorney representation can make a significant difference in the outcome of your case. Under Illinois law (625 ILCS 5/15-112), “Any police officer having reason to believe that the weight of a vehicle and load is unlawful shall require the driver to stop and submit to a weighing.” The officer can use portable or stationary scales or, if not available, the officer can require that the vehicle be driven to the nearest available scale. If the officer determines that the vehicle is overweight, the officer can require that the vehicle stop in a suitable place and remain there until the portion of the load necessary to reduce the weight to the required limit (under the law or allowed by permit) is reached. If the officer determines that the truck is overweight on axle weight limits, the owner or operator may shift the load in order to comply prior to release of the vehicle. In either situation, the officer will charge the driver accordingly and assess the appropriate fine amount set under 625 ILCS 5/15-111. Of course, this process can cause extreme delays in the driver’s route and schedule. However, if a driver refuses to stop and submit his vehicle and load to weighing or removes any part of the load prior to weighing, he will be charged with a business offense and face a fine of $500 to $2000. The attorneys at The Davis Law Group, P.C. represent truck drivers and trucking companies facing overweight violations throughout Illinois. Our lawyers have handled hundreds of overweight violations and are knowledgeable in the relevant Illinois law. Many times, paying high fines for these violations is viewed as a cost of doing business on Illinois roadways. However, it is important to defend these violations, rather than simply accepting the original fine assessed by the officer. From negotiating a reduction of the fine to challenging the violation at trial, every overweight truck violation should be thoroughly analyzed in order to determine the most effective strategy. Weighing the cost and benefit is a necessary part of this equation. In many cases, we can avoid the need for you or your driver to take additional valuable time off of the road to appear in court. We regularly appear in court throughout the Chicagoland area including Cook County, Lake County, DuPage County and Will County. Contact the attorneys at The Davis Law Group, P.C. to discuss your Illinois overweight truck violation.